I finally got a chance on Friday to catch up with William Wynne of FlyCorvair.com to see if there had been much in the way of improvements to the Corvair conversion since mine first flew about a year and a half ago. At that time, I was the proud recipient of the latest and greatest in Corvair technology. Unfortunately (for me), William's been quite busy since then. 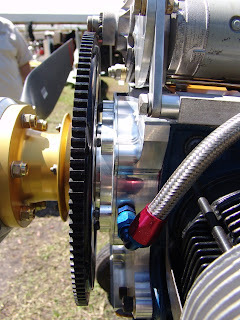 The highly modified Corvair engine on the stand featured quite a few improvements, and this was my first glance at them up close and personal like. The most obvious to me was the new single piece gold anodized propeller hub, replacing its black two-piece forerunner. The gold hub features lighter weight, a smaller pulley for better alternator performance, and (of course) is much simpler than its two part, bolt together predecessor. 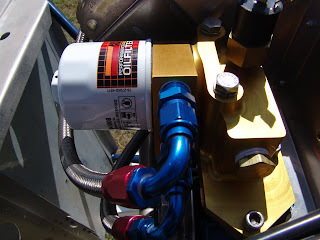 A new oil filter arrangement, also gold anodized and simplified, now attaches directly to the engine instead of the old method which required the circuitous routing of oil hoses to a mount on the firewall. Once glance told me that this new oil filter system also saves weight, is much cleaner, and (once again) gets the most out of simplicity. William also had the new gold anodized, CNC machined oil pan that replaces the slightly "Frankenstein-esque" hand welded one. And just to top it all off, a matching gold anodized top engine plate was also on display. With all of these new gold parts on the display engine, the Corvair is starting to look like something you might find in the Tiffany catalogue. Perhaps the most significant improvement is the new 5th crankshaft bearing, tucked in nicely behind the ring gear and the engine block. The need for a fifth bearing to absorb asymmetric side loads from out of balance prop/spinner/extension combinations or the stresses created by sudden yanking and banking became known when a few cases of crankshaft cracks and separations behind the last journal were reported. The first assault on the problem was to strongly suggest the nitriding of all crankshafts, and the second was the development of the fifth bearing. I really was planning to leave my own Corvair engine in my Zodiac alone for the time being, but now that I've seen the sum total of all of the improvements, I'm reconsidering. 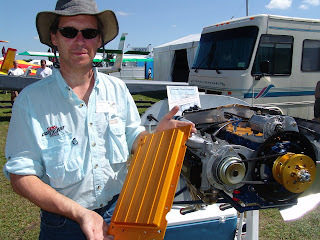 Besides, all those beautifully machined gold parts would really set off the engine compartment, eh? Check out the latest in Corvair improvements at FlyCorvair.com. 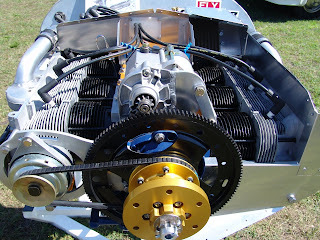 I'm proud to say that the engine pictured is my engine that William has built for me and my Zenith 601XL.